“a due”. Arte Contemporanea in Italia e Belgio (“in twos”. 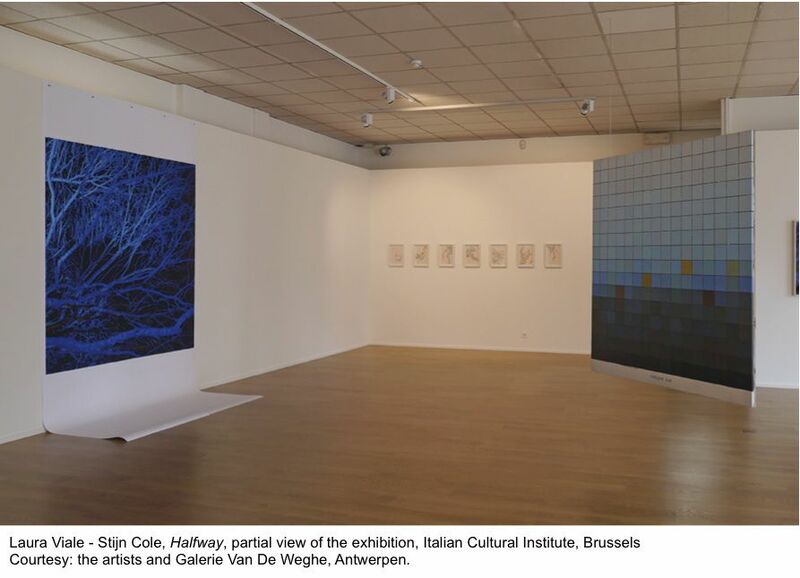 Contemporary Art in Italy and Belgium), conceived and curated by Laura Viale for the Italian Cultural Institute in Brussels, is a project that opens a dialogue between Italian and Belgian artists who have emerged since the 1990s up to the latest generations. 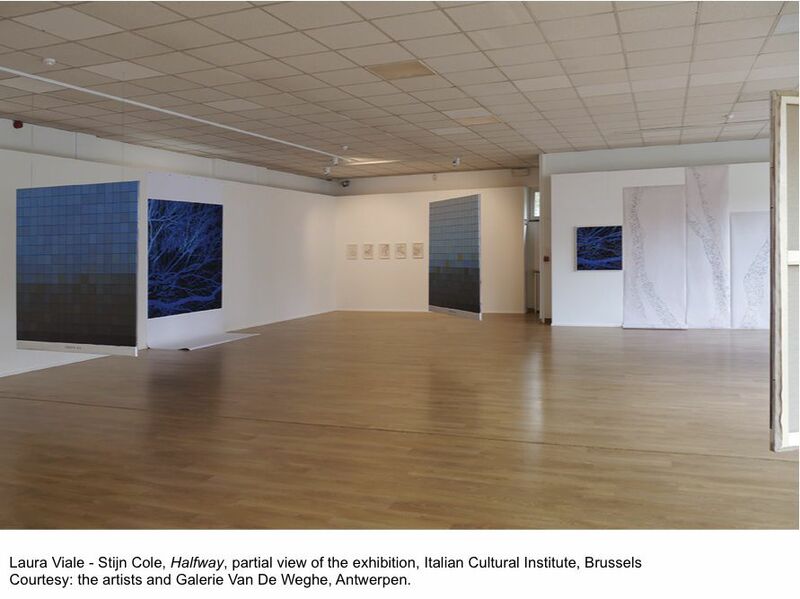 It originates from an invitation to Laura Viale to exhibit her work in the Institute, which the artist extended to some of her Italian colleagues with Belgian connections, asking each one to invite a Belgian artist to create a relationship of affinity or contrast. The project was developed with the critic contribution of the art historian Maria Elena Minuto. From November 2015 to March 2018, “a due” hosted exhibitions, performances and encounters that highlight the relationships between artists coming from different cultures, experiences and generations. 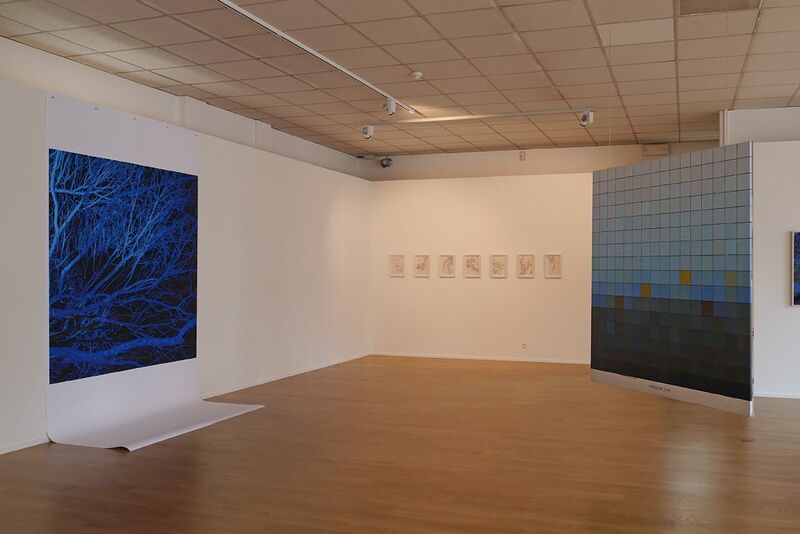 The following pairs of artists exhibited their works: Davide Bertocchi (Modena, 1969) and Joris Van de Moortel (Ghent, 1983), Enrico Gaido (Turin, 1971) and Freek Wambacq (Brussels, 1978), Margherita Moscardini (Donoratico, 1981) and Futurefarmers (Belgium-USA, collective founded in 1995), Laura Viale (Turin, 1967) and StijnCole (Ghent, 1978), Raffaella Crispino (Naples, 1979) and Hans Demeulenaere (Ostend, 1974), Alberto Scodro (Marostica, 1984) and Paul De Vree (Antwerp, 1909-1982), Serena Fineschi-Alessandro Scarabello (Siena, 1973 and Rome, 1979) and Hans Op de Beeck (Turnhout, 1969). Since the late Middle Ages, scenes of everyday life, common objects and domestic environments have characterized the figurative culture of the Low Countries. The "mirror", the "still life", the "masks" and the minutely represented "detail" incarnate obsessions with raw realism. Fascinated by these emblems and iconographies, the artists Fineschi, Scarabello and Op de Beeck open a dialogue in this exhibition with Belgian art and its feeling for the grotesque and the absolute. Presenting a body of works, including paintings, sculptures and videos, the artists reflect on the relentless flow of time, on the reality underlying the appearance of things and on the human condition in all its nuances, ambitions and privations. Hosted by the Italian Institute of Culture in Brussels and the Musées royaux des Beaux-Arts de Belgique, Rendez-vous reveals a unique view of Northern European imaginary and its history. 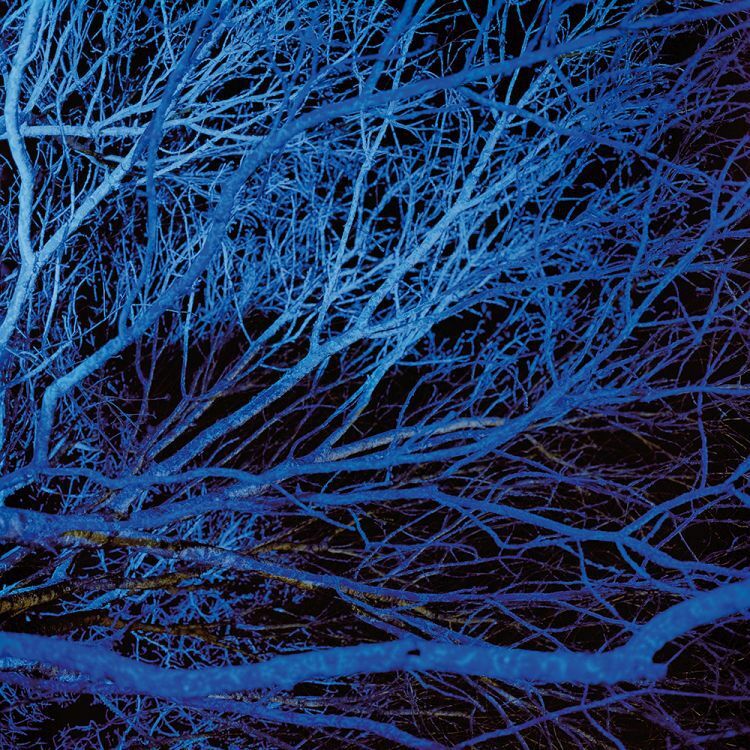 The exhibition rediscovers ghosts, mysteries and melancholic sensations through an extraordinarily contemporary perspective. Serena Fineschi (Siena, 1973) lives and works in Siena and Brussels. 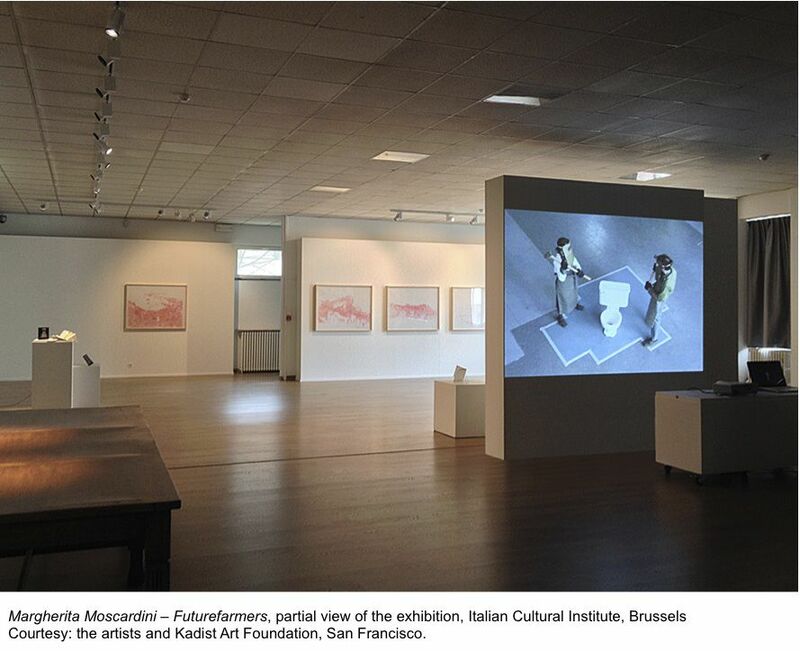 The artist has exhibited her works in numerous public and private spaces in Italy and abroad including: the Frédéric De Goldschmidt Collection and the Officina in Brussels, Belgium; the Museo d’Arte Moderna e Contemporanea Raffaele de Grada in San Gimignano, the SMS Complesso Museale Santa Maria della Scala in Siena, the Centro d’Arte Contemporanea Palazzo delle Papesse in Siena, the Corderie dell’Arsenale in Venice (during the 15th Biennial of Architecture, 2016), the Casa Masaccio Arte Contemporanea in San Giovanni Valdarno, Italy. Alessandro Scarabello (Rome, 1979) lives and works in Brussels. Scarabello holds a BFA from the Fine Arts Academy of Rome and a MFA from the Royal Academy of Fine Arts (KASK) of Ghent. He has exhibited in several public and private institutions in Italy including: the Padiglione d'Arte Contemporanea in Milan (PAC); the Palazzo Collicola in Spoleto; the Palazzo delle Esposizioni in Rome. Scarabello has been invited to several biennial events including the Bienal del fine del mundo in South America; the Biennial for Mediterranean Countries in Alexandria, Egypt; the Biennial of Tunis, Tunisia, and the Biennial of young artists in Monza, Italy. Hans Op de Beeck (Turnhout, 1969) lives and works in Brussels and Gooik, Belgium. Op de Beeck has participated in numerous group and solo shows at institutions such us: Venice Biennale, Venice, Hangar Bicocca, Milan, MACRO, Rome, IT; M HKA Museum, Antwerp, BE; Tate Modern, London, GB; Whitechapel Art Gallery, London, GB; Musée National d’Art Moderne, Centre Pompidou, Paris, FR; Kunsthalle Wien, Vienna, AT; PS1, New York, MOCA Cleveland, US; MAMBA, Buenos Aires, AR; Singapore Biennale, SG; Shanghai Biennale, CN; Aichi Triennale, and Hara Museum of Contemporary Art, Tokyo, JP. Hermetic and full of elements creating tension in the space surrounding them, Alberto Scodro’s installations and sculptures in multiple materials interpret in this exhibition the eclectic works of Paul De Vree, artist, concrete and visual poet as well as father of Flemish sound poetry. Cime e Terre (Scodro, 2017), a homage to the 1971 work by the Belgian artist with the same title, is a large tapestry whose refined warp in wool, nylon and polyester represents an enigmatic staircase and some vine leaves, emblems of a dimension which is both near and far, alive and lost at the same time. Just like the title of the exhibition, they too subtly allude to the cycle of life and its continuous dialectic movement of ascent and descent, birth and rebirth. 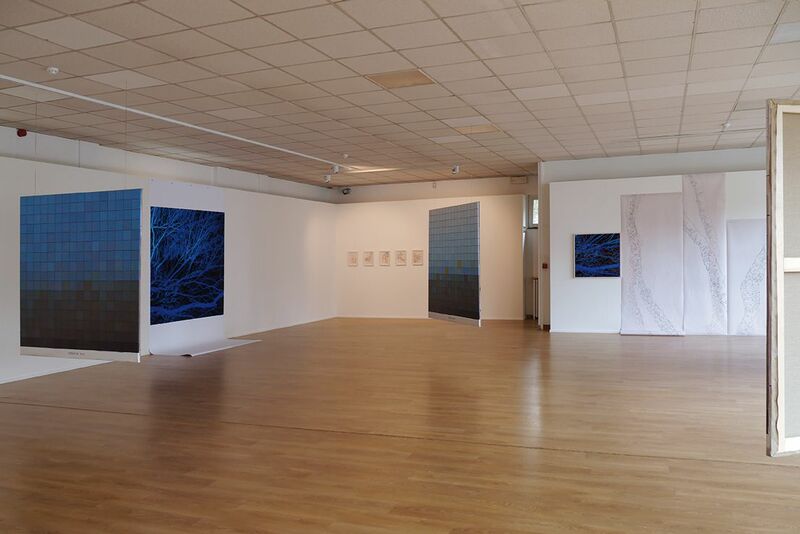 The exhibition also contains a series of paintings (Maskers, 1972), watercolours (Oologica Belgica, 1945-1967), films (Essentieel, 1964; Mijn Evanaaste, 1963) and artists’ books representing De Vree’s multifaceted research on words focusing on their literal, visual, sound and performative nature. Alberto Scodro (Marostica, 1984) has been a resident artist at the RAVI in Liège (2016), the HIAP in Helsinki (2014) and at the Bevilacqua la Masa Foundation in Venice (2009-2010). His most recent solo exhibitions include: Eocene, Car DRDE Gallery, Bologna, 2017; Lago nella punta dell’ago, MAG Museum, Riva del Garda, Trento, 2015; The sight couldn’t be any better, Augusta Gallery, Suomelinna, Helsinki, 2014; Spannung, Viafarini, Milan, 2013; Floating Tonalite Stone, Villa Dalegno, Brescia, 2012; Alberto Scodro, Agricultural Centre, Beijing, 2010. Among his group exhibitions: Won’t you not see?, Maison Gregoire, Brussels, 2015; Person in Less, Sandretto Re Rebaudengo Foundation, Turin, 2010. Paul De Vree (Antwerp, 1909-1982) was a visual artist and pioneer of european Concrete Poetry. In Belgium he founded and directed the avant-garde literary magazines De Tafelronde (1953-1982) and Vers Univers (1966-1967), in Italy he was the editor of Lotta Poetica (1971-1975) and Factotum-Art (1977-1979) in collaboration with the Italian poet Sarenco. 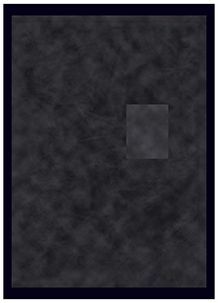 His main solo and group exhibitions include: Neonlicht, M HKA, Antwerp, 2012; Opere di Paul De Vree nelle collezioni Italiane, Rocca di Umbertide, Perugia, 2004; Poesia Totale. 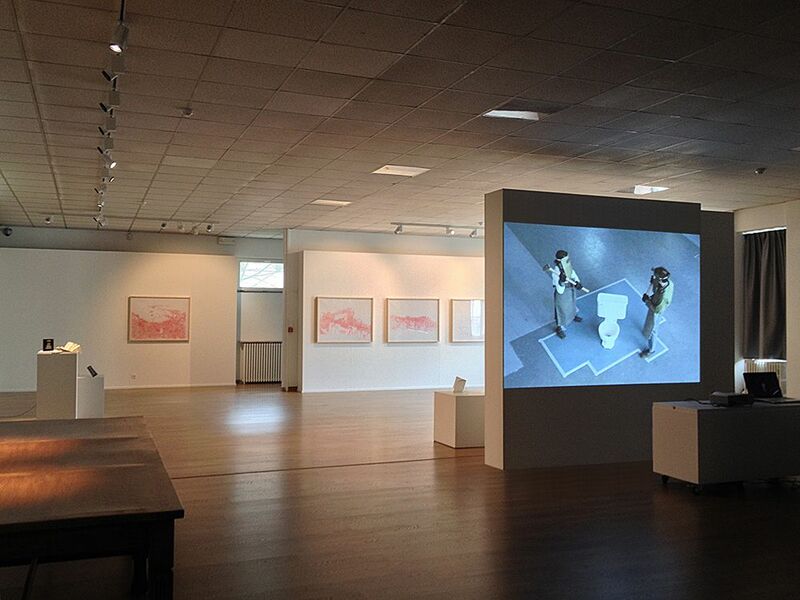 1897-1997, Palazzo della Ragione, Mantua, 1998; Paul De Vree, CC Hasselt, 1981; 20 jaar de Tafelronde, Internationaal Cultureel Centrum, Antwerp, 1975; Paul De Vree: Poesia Visiva, KMSKA, Antwerp, 1974; Sound Texts Concrete Poetry Visual Texts, Stedelijk Museum, Amsterdam, 1970. With the kind support of M HKA, Antwerp, Fondazione Bonotto and Bonotto SpA, Molvena (Vicenza, Italy). What We Can Use, What We Can't Move results from a close collaboration between the two artists and originates as an ironical analysis of the limits and possibilities offered by the exhibition space of the Italian Cultural Institute. The photographic archives of the two artists become the starting point for the creation of their works. With a critical rereading of “display in art” and “the art of display”, Crispino and Demeulenaere reflect on the critical and linguistic rationale behind contemporary art exhibition and curatorial methodologies. A selection of the material produced and preserved by the artists develops a complex narrative made up of images, objects, sculptures and installations that leave visible traces of their creative and exploratory process. Raffaella Crispino (Naples, 1979) lives and works in Brussels. After graduating in Visual Arts at the IUAV in Venice (2007), she has been a resident artist at the HISK in Ghent (2014-15), the JCVA in Jerusalem (2010) and the CCA-Kitakyushu in Japan (2008-2009). In 2013 she won the Young Artistic Talent Award and Prix Médiatine in Brussels. 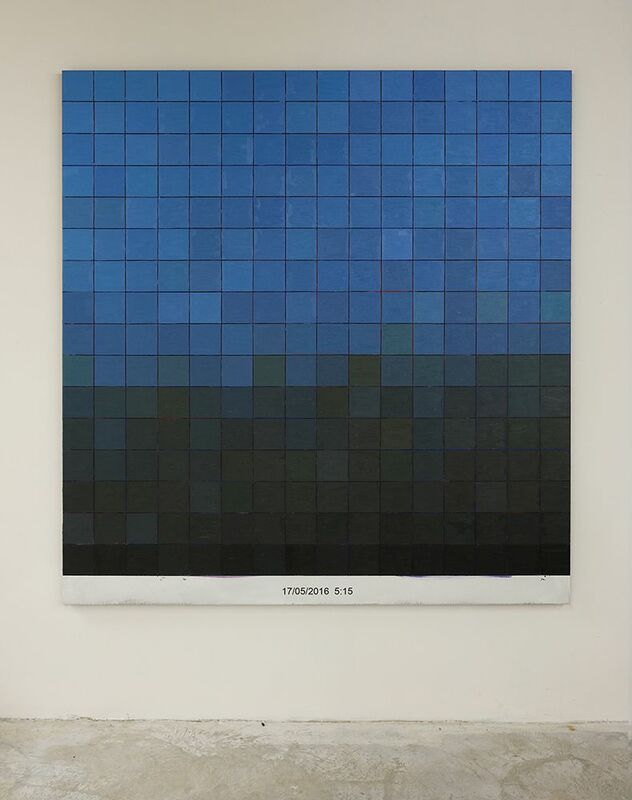 Her most recent solo exhibitions include: Tokyo - San Francisco, Super Dakota Gallery, Brussels (2016); c/o Alternate Correspondence in collaboration with Kasper Bosmans, 1/9unosunove Gallery, Rome (2015); Faux en écriture, Dauwens & Beernaert Gallery, Brussels (2016); and It takes two to make an accident, HISK, Ghent (2015). Hans Demeulenaere (Ostend, 1974) lives and works in Bruges. He graduated in Visual Arts at the LUCA School of Arts in Ghent and has been a resident artist at the Masereelcentrum in Kasterlee (2016) and the Workspacebrussels in Brussels (2015). His most recent exhibitions include: You make a better door than you do a window, with Emi Kodama, Beursschouwburg, Brussels (2016); Politics of Installation, with Bas van den Hurk, P/////AKT, Amsterdam (2015); Be ALL AND END ALL, with Herman Van Ingelgem and Marc Nagtzaam, Millington Marriott, London (2015); Some Objects, Eight Sculptures. 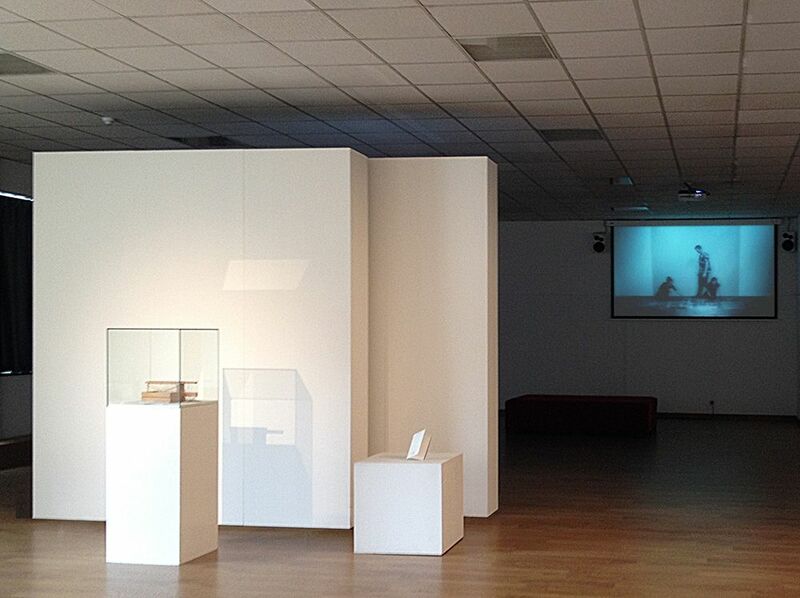 Several Frames, One Video and a Book, Mu.ZEE, Ostend (2014); The Gathering Of Characters And Forms (Chapter I), Dash, Kortrijk, (2014); and A Never Ending Story, Extra City Kunsthalle, Antwerp (2013). Halfway by Laura Viale and Stijn Cole comprises photographs, paintings, drawings and installations, specifically conceived in the area around Vittel in France. The landscape in this part of Lorraine, which is exactly halfway between Turin and Ghent (the artists’ cities of origin), was chosen by the artists as a symbolic place for their productions, which make use of oil colours, graph paper, and photographic and digital prints. The works on view in the exhibition, inspired by this original “halfway” encounter and created from natural elements gathered locally, reflect on themes that are constantly present in the artistic search of the two artists, such as the relationship between nature and artifice, the external environment and the mental dimension, and concrete experience and abstraction. The collaboration between the two artists began in March 2016, with the exhibition LumièreMatière at the Académie royale des Beaux-Arts in Brussels, which invited the two artists to exhibit in a dialogue with some of the Academy's alumni and Master students. 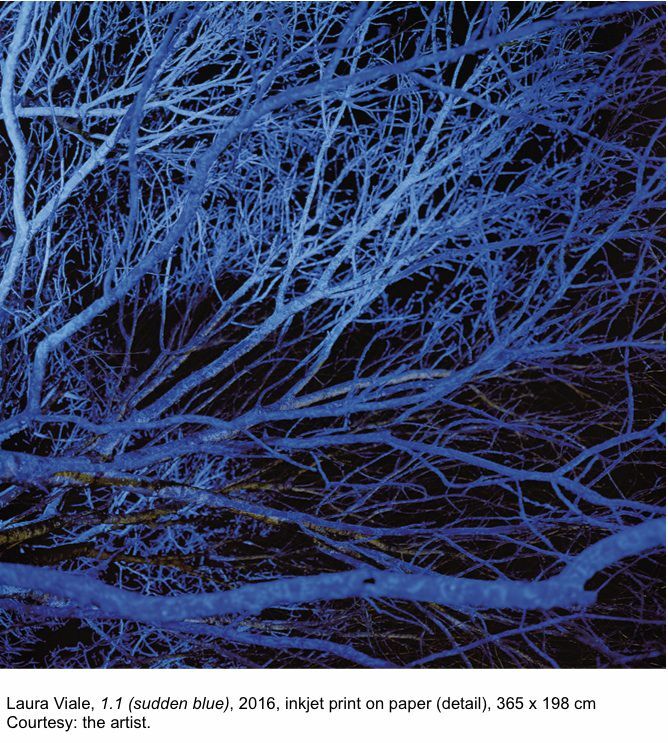 Laura Viale (Turin, 1967) lives and works in Brussels. Her works have been widely exhibited, in places such as PAV – Centro d’Arte Contemporanea, Museo Nazionale del Cinema and Museo di Scienze Naturali in Turin; Museo d’Arte Contemporanea di Villa Croce in Genoa; Museo Marino Marini in Florence; Fondazione Bottari Lattes in Monforte d’Alba; and Galleria Civica d’Arte Contemporanea and MART in Trento. She was also a guest artist at the Djerassi Foundation in California, the Atlantic Center for the Arts in Florida and the Fondation La Napoule in France. Stijn Cole (Ghent, 1978) lives and works in Chimay. His works include paintings, installations and sculptures, using a variety of media, including video, paint and graphic work. He has exhibited in a number of institutions and galleries, such as the Museum of Fine Art and De Witte Zaal in Ghent; Museum Dhondt-Dhaenens in Deurle; Be Part Foundation in Waregem; Second Room in Brussels; Garage in Malines; Kunstverein Schwerte and Kunstverein Ahlen in Germany; Galerie Van De Weghe and Galerie Geukens & De Vil in Antwerp; and Galerie Kunst-zicht in Ghent. In partnership with ArBA-EsA, Brussels. With the kind support of Chimay. 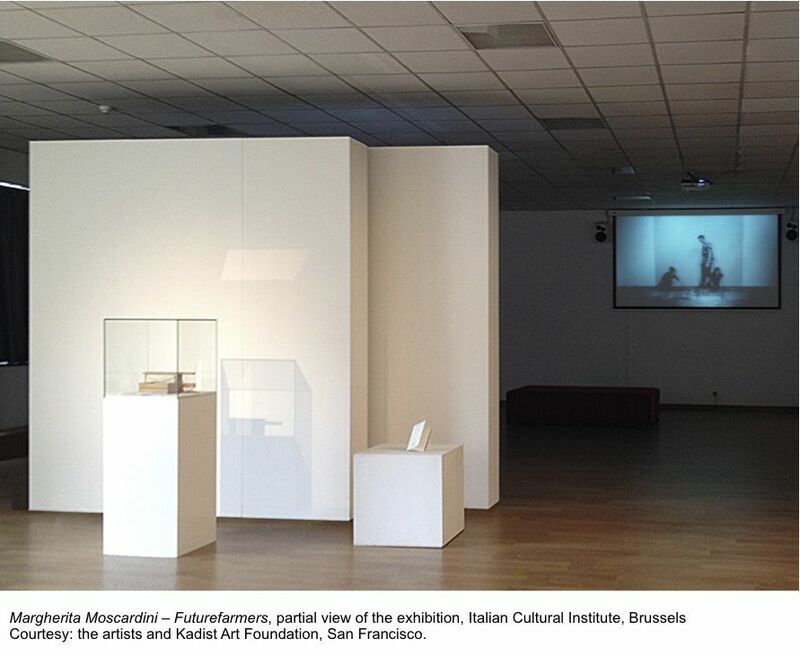 The exhibition Margherita Moscardini - Futurefarmers shows a series of works (videos, drawings and artists’ books), whose main subject is a reflection on the concept of “transformation”. Using a variety of approaches and languages, the works focus on the contradictions resulting from the processes of urbanisation. The artists, who have a long-standing interest in studying urban spaces and their multi-faceted sociopolitical implications and investigating alternative ways of approaching the urban-rural divide, will be exhibiting for the first time in Belgium two emblematic works: Istanbul City Hills - On the Natural History of Dispersion and States of Aggregation (Moscardini, 2013-14) and Erratum: Brief Interruptions in the Waste Stream (Futurefarmers, 2010). Margherita Moscardini (Donoratico, 1981) studied Cultural Anthropology and attended the XIV Advanced Course in Visual Arts (CSAV) of the Fondazione Antonio Ratti in Como with Yona Friedman in 2008. She was a guest artist at the MMCA in Seoul and the ISCP in New York, and was a fellow at the Italian Academy for Advanced Studies in America, Columbia University, New York. Her work has been exhibited at the IIC in Istanbul, the SongEun ArtSpace in Seoul, the Fondazione MAXXI in Rome and Palazzo Reale in Milan. The Futurefarmers (Belgium-USA) is an artist collective founded by Amy Franceschini in 1995 which brings together artists, designers, activists and architects, whose works present alternative ways of seeing and inhabiting the spaces in large cities. Their works have been exhibited in numerous international museums, including the Whitney Museum of American Art, the New York Museum of Modern Art, the Solomon R. Guggenheim and New York Hall of Sciences in New York; the MAXXI in Rome and the Walker Art Center in Minneapolis. The exhibition Enrico Gaido – Freek Wambacq presents a selection of works different in technique and content, but all reflecting as a primary object the research on matter and its change in time. Fascinated by the power relations and interactions between different elements Gaido questions the processes of equilibrium/disequilibrium that are created between expansion concrete and wood (502,65cm3, 2015) or explosive and gelatine (Exploding Utopia, 2013), whereas Wambacq, with his “saturated prints”, examines the controversial relationship that is sometimes created between the image and its surface (L’oreiller de la Belle Aurore, 2015). Just as ideas and shapes are constantly renewed within a laboratory, in this exhibition the artists experiment continuously with their materials, which are analysed in relation to their physical characteristics, and also to their more abstract and “immaterial” variations. Gaido's works radicalise the “tensive state” between different elements, while in Wambacq's works a culinary practice is transposed into a visual practice, giving rise to magnetic abstracts stretching our (good) taste of pâtés and terrines. Enrico Gaido (Turin, 1971) lives and works in Brussels. In 1998 he graduated in Architectural Engineering at the Polytechnic of Turin and in 2004 created, together with Alessandra Lappano, the art project Portage. His works have been exhibited in international museums and institutions, such as the Palais de Tokyo in Paris, the Art Rotterdam Fair in Rotterdam, the Fondazione Merz in Turin, MACRO/La Pelanda in Rome and the Fondazione Pistoletto Cittadellarte in Biella. Between 2006 and 2014 he worked with the “Teatro Stabile” in Turin and in 2010 he won the “Focus On Art and Science in the Performing Arts” prize promoted by the European Contemporary Product with his project Il Tetto. Freek Wambacq (Brussels, 1978) lives and works in Amsterdam. In 2000 he graduated at the Sint-Lukas University College of Art & Design in Brussels and had a residency at the Gasworks in London (2015) and the Künstlerhaus Bethaniën in Berlin (2010-2011). His works have been exhibited in numerous international locations, such as WIELS and Middlemarch in Brussels, Witte de With in Rotterdam, Objectif Exhibitions and M HKA in Antwerp, Künstlerhaus Bethaniën in Berlin, Casino Luxembourg in Luxembourg, Queen’s Nails Projects in San Francisco and S.M.A.K. in Ghent. In 2011 he won the “Young Belgian Painter’s Award” promoted by the ING. Davide Bertocchi (Modena, 1969) lives and works in Paris. His work has been exhibited in numerous museums, galleries and international institutions, including La Maison Rouge, Paris; Bozar, Brussels; De Appel, Amsterdam; Fondation d'entreprise Ricard, Paris; the Lyon Biennale; Palazzo Esposizioni, Rome; Espace Louis Vuitton, Paris; Palais de Tokyo, Paris; the Prague Biennale; La Monnaie de Paris; the Bronx Museum; and MoCA Shanghai. Joris Van de Moortel (Ghent, 1983), lives and works in Antwerp. 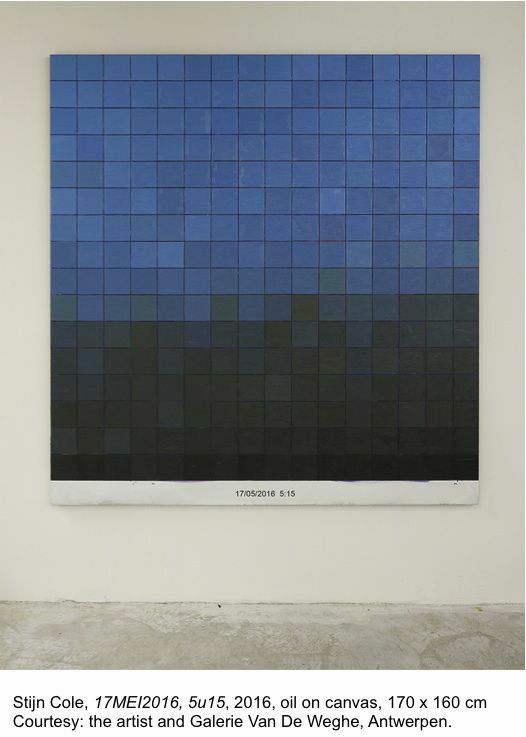 Having graduated from the HISK (Ghent) in 2009, and resided at the Künstelerhaus Bethanien (Berlin) in 2012 and 2013. His works have been exhibited in various international institutions, among which Palais de Tokyo, Paris; Central Museum, Utrecht; Museum Cultuur Strombeek, Grimbergen; Fondation Boghossian - Villa Empain, Brussels; Musée Sainte-Croix, Poitiers; BE-PART Contemporary Art Center, Waregem. With the kind support of Hopstreet Gallery, Brussels, and Galerie Nathalie Obadia, Paris /Brussels.